Construction is no longer hidden behind the green construction wall. Aloha! Its been four months since I last reported about the new Disney resort under construction at Ko Olina in Hawai‘i. Today I have recent construction photos (November 2009), along with new photos of the model from the D23 Expo (September 2009). 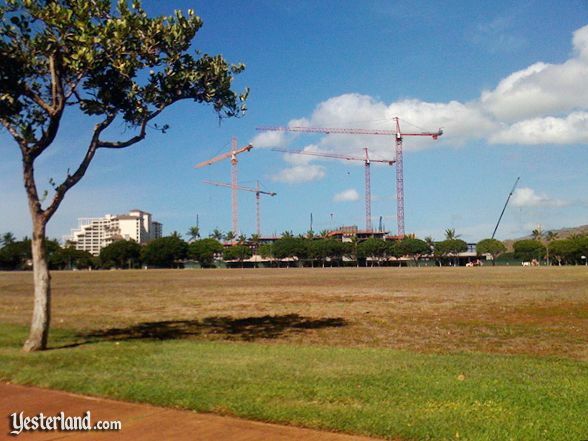 Cranes tower above the 21-acre Disney site at O‘ahus Ko Olina Resort. I wish I could say that Im in Hawai‘i and that I took these construction photos for you. The truth is that Im in my cold basement in the Chicago suburbs. 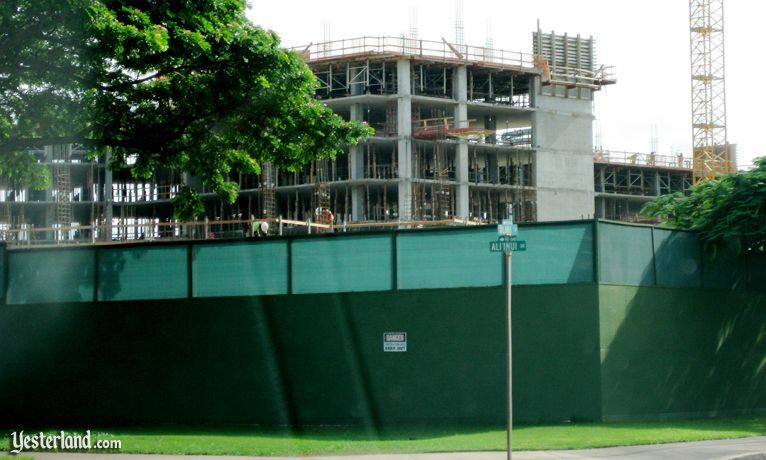 I received these construction photos from Yesterland reader Carol Noyes, who just returned from the Ko Olina Resort. 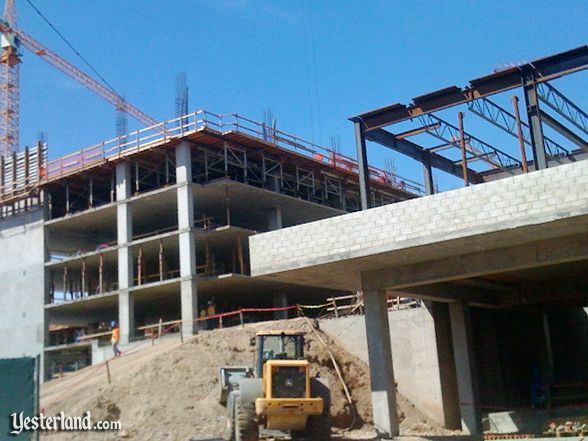 The DVC wing (left) and conference center (right) are rising. Disneys oceanfront resort at Ko Olina on the west coast of O‘ahu will have 350 hotel rooms, 480 two-bedroom Disney Vacation Club (DVC) villas, a conference center, spa, restaurants, and spacious grounds. The mega-resort will have its own manmade snorkeling lagoon, a spectacular volcano-themed water slide, a lazy river, and even a traditional Hawaiian taro field. Although the buildings will eventually look like wood and thatch, theyre now concrete and steel. Its now been a little over one year since Disney broke ground with a Hawaiian blessing ceremony on November 19, 2008. After site preparation during the first half of 2009, construction of the buildings began in summer. The massive resort is scheduled to open in 2011, although no date has been announced. Theres also no date for when Disney will begin selling DVC points, and there probably wont be a DVC point chart until then. As the first four photos in this article indicate, Disneys Grand Hawaiian Resort & Spa (or whatever its eventually named) is now growing upward. The 2011 target seems reasonable and attainable. For the next seven photos, we return to the mainland. One of the many surprises in the Disney Parks and Resorts pavilion at the D23 Expo was a detailed model of the resort. The model of the Disney resort at Ko Olina was on display at the D23 Expo. I admired photos of the same model when Disney first released them in October 2008. At that time, the model was in Hawai‘i, and Disney was showing it off to Hawaiian public officials and media. I zoomed in on the details in the photos for my October 21, 2008, article, A Closer look. I never thought Id get to see the model myself. Guests will arrive at an open-air lobby building, dubbed Hale Aloha. The design of the building is based on a traditional Hawaiian canoe house. Its not unusual for a resort hotel in Hawai‘i to have an open-air lobby; in fact, its the norm. Although daytime high temperatures in this part of O‘ahu average in the 80s all year, tradewinds from the sea keep the air comfortable. In the photo above, note the murals on the ends of the tall building. The pool area is on the grand scale of Stormalong Bay at Disneys Yacht & Beach Club Resorts (or perhaps this tropical paradise is even more grand). At the right edge of the photo, you can catch a glimpse of part of the taro patch. Cars will be limited to the entry drive, two parking structures, and some open-air parking along the roads. Its possible to enjoy Ko Olina without a car. With the great beach and pools, some guests wont want to leave the immediate resort area for their entire stay. In addition to the restaurants within the Disney resort, there are restaurants in walking distance at the JW Marriott Ihilani next door, at Marriotts Ko Olina Beach Club down the oceanfront walk, at the nearby golf course (Roys), and at the two new shopping centers across the street. However, most guests will probably want a rental car for airport transportation, for access to the many attractions of O‘ahu, and to shop at Costco, Target, and Safeway in the nearby city of Kapolei. The Conference Center (center, lower half of photo) is between the DVC wing and one of the parking structures. The Disney resort wont be just for vacationers. The resort will also offer “63,000 square feet of flexible indoor and outdoor function space.” That sounds like a lot of space. A closer look reveals that Disney classifies only 14,545 square feet as part of the actual Conference Center—and, of that, 3,500 square feet is an outdoor patio! The great majority of the “flexible indoor and outdoor function space” consists of three event lawns totaling 48,685 square feet—the lawns that you see in the photos of the model. What all this really means is that, despite the conference facilities, this wont be one of those hotels with a bunch of people running around with name tags. There will undoubtedly be small off-site corporate retreats, lawn weddings, and other social events—but no conventions. The Disney resort site shares a manmade lagoon with the JW Marriott Ihilani. Imagine its the 1980s. Youre a real estate developer who wants to develop a Hawaiian beachfront resort. O‘ahu has an ever-increasing number of visitors, but Waikiki, with its Manhatten-like density, has no vacant land for new hotels. You envision a masterplanned development, like Kaanapali on Maui, with upscale resort hotels, restaurants, shopping, a golf course, and even something that Kaanapali doesnt have—a pleasure boat marina. You have a 642-acre parcel of oceanfront property with perfect weather, beautiful sunsets, and freeway access from the airport. The beach may be artificial, but that doesnt make it any less wonderful. Theres only one problem. Theres no beach, only a rocky shoreline. So what do you do? You get approval to build four large semi-circular lagoons, with sandy beaches that gently curve around each lagoon. The lagoons are beautiful; theyre protected; and the swimming is great. You call the development Ko Olina—Hawaiian for “the place of joy.” Part of the deal with the government is that these will be public beaches (but you make it difficult for the general public to park their cars). The model is great. But the real thing will be even better. 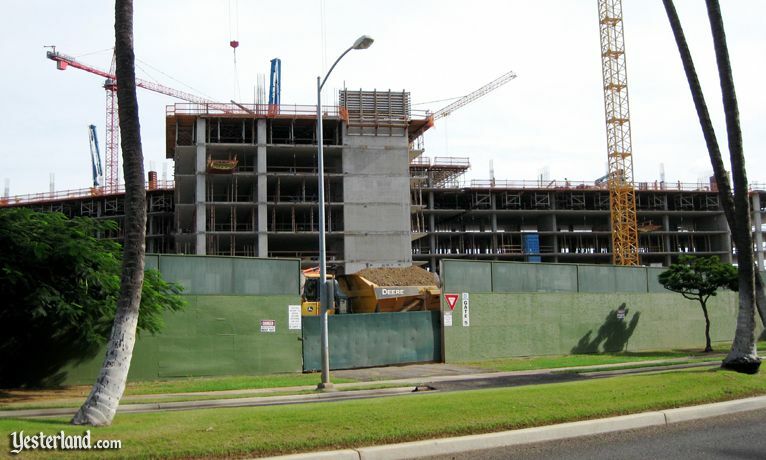 Four photos of Disney Ko Olina construction: Carol Noyes, November 2009. Seven photos of Disney Ko Olina model: Werner Weiss, September 2009.